So I found this week’s recipe by googling “ground beef”. 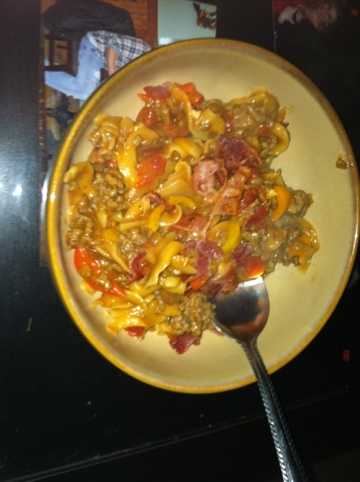 I had some in the freezer and I found a recipe which looked pretty easy called Spanish Noodles ‘N Ground Beef. Now, I haven’t been able to figure out what was so Spanish about the recipe, so I just renamed my version Spicy Noodles and Beef. Like all my recipes I tweeked it a bit. Not much though. When it called for Chili Sauce, I used Sriracha Hot Sauce (which is an Asian chili sauce, pretty much). In the first picture, it is the bottle which is on top of the diced tomato can. This definitely gave the recipe a bit of a kick. I don’ t know if it is spicier or what. Maybe I’ll try it with Heinz Chili Sauce next time. I also didn’t use a green pepper. I had a bunch of sweet mini peppers (red, orange and yellow) so I used those instead. 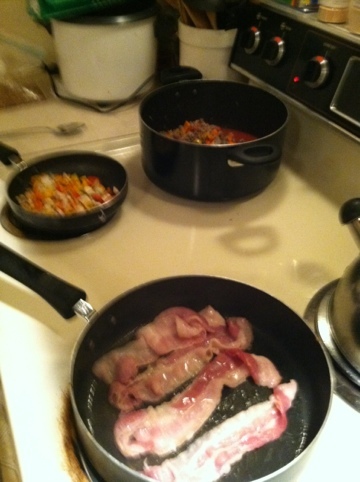 I also increased the amount of peppers and onions the recipe called for, because…. well, I simply don’t follow instructions! This recipe was super quick and easy. I think the only thing I wasn’t a huge fan of was the bacon. I like turkey bacon, and even though I tried to make it crispy, I found the crumbles to be a bit chewy and the texture was strange. I don’t think the bacon did a lot for the dish as a whole, but maybe the next time I make this, I’ll give it a go with real bacon. Who knows. 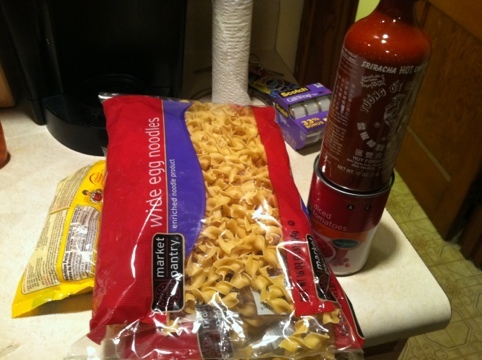 I did try to be extra vigilant when I cooked the noodles in the sauce. I didn’t want them to be over cooked, and I also really didn’t want undercooked noodles. Luckily they tasted just fine, but I was a bit concerned with this while they were cooking. I’m used to boiling all my pasta. I’m not used to cooking it in the sauce. It did taste super fantastic though, and I’m sure that has something to do with how it was cooked. That’s it folks! Easy as pie. Check out Taste of Home for the original recipe. I’d post it here, but I didn’t change how it was cooked at all. I just altered the ingredients a bit. You’ve gotta give credit where it’s due! This entry was posted in 101 in 1001, Cooking.